Rest Day in Heaven-Kissing Park! When I visited Sky Park, a part of World Cup Park, in Mapo-gu, it gave me a relaxing time because I had been going through a really tough time. Taking a step on the sky stairway, strolling in a silver grass field, looking down the view of Seoul from an observatory called the “Sky Embracing Bowl” and the wind turbines…. All of these features in Sky Park seemed to give plenty of inspiration to visitors. However, you can enjoy an even more meaningful and tangible rest if you know the history of this place in advance and the process of its construction under Seoul’s special goals of achievement. Nanjido, located beside the Han River, was originally a precious ecological repository full of orchids, flowers, and migratory birds. However, in 1978, it was turned into a landfill, and it gradually grew into a mountain of garbage over the course of 15 years. According to the urban management policy of Seoul, the condition of Nanjido was finally reversed. The city government realized that Nanjido signified human connivance toward environmental destruction under the rapid growth of South Korea’s industrialization. This same realization has also aroused a self-examination in Korean society. Nanjido received a new name, World Cup Park, and went through a reformation with the special vision of “environmentally sound and sustainable development.” World Cup Park now has five themed sections: Sky Park, Peace Park, Sunset Park, Nanjicheon Park, and Nanji Han River Park. Sky Park, one of the hot places to go for a date or picnic, has a commendable theme in the light of its beautiful scenery with a strong ecological meaning. 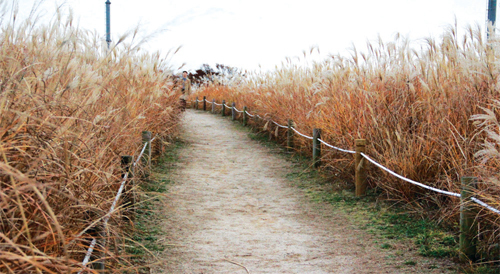 The ground of Sky Park was the most barren area in Nanjido, and it is a symbolic place to show how nature begins its own recovery. The vast grassland stretches out right in front of our eyes. Woolly grass, silver grass, and wild plants such as thistle, violet, and clover are here and there in the grassland, and about 30,000 varieties of butterflies were released to the grassland to stabilize the plant ecosystem. 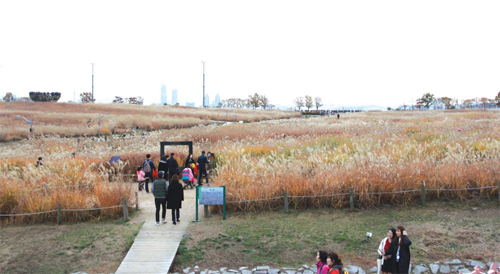 Sky Park has a special meaning as it demonstrates how Seoul managed to change the wasteland into an ecological space with some special elements. The following will tell you about it. Silver Grass Field spreads out in a clear view over the vast area. Seeing this field of tall and wild grass swaying with the wind, I could find peace in mind. Visitors strolling in this endless sea of silver grass seemed to enjoy their own relaxing time with their beloved families, friends, and lovers while taking pictures and enjoying nature. There was also a newly married couple taking wedding photos, and they brought smiles to people’s faces with their pleasant yet austere ceremony. 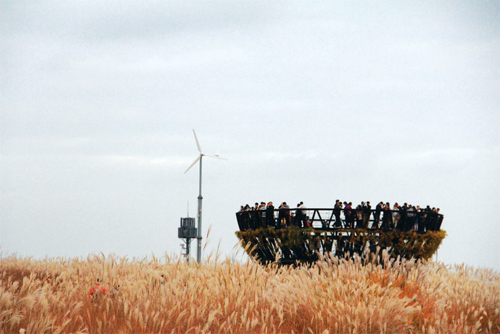 It seemed that Silver Grass Field offered people refreshment with its adorable view of simple nature. “Sky Embracing Bowl” is an observatory where visitors can look down the entire scenery of Seoul, including the Han River and Bukhan Mountain. It has an unusual appearance, like a massive bowl. During the planning of Sky Park, the use of manmade structures collided with the goal of the park, so Seoul decided to make an observatory using a frame structure made of as little iron as possible. The six wisteria vines covering it help it blend into Sky Park. The observatory looks like a full bowl with so many people spending time in it. Five Wind Turbines were constructed to represent the eco-friendly image of World Cup Park. 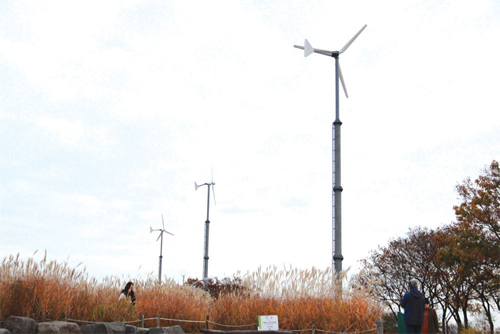 They provide about 50KW of electric power using wind blowing from Han River at a height of 98 meters. This clean energy is used for lights in the park and for the operation of an Information Center. Located next to the observatory, it also serves as a wonderful piece of ecological scenery. Although Sky Park is the most famous in World Cup Park, Peace Park, Sunset Park, Nanjicheon Park, and Nanji Han River Park also offer a wonderful experience to visitors. There is an exhibition hall in Peace Park to introduce the history of Nanjido, and there are camping sites in the Sunset Park. You can find more such as a botanical garden, a festival venue, a firefly observation center, and many other interesting places in the other sections. I recommend you to visit this park if you need refreshment.